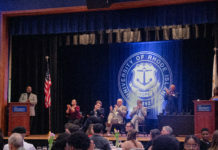 Weather is getting warmer, final exams are looming around the corner and another class of students is preparing to graduate from the University of Rhode Island. With that comes the announcement of this year’s commencement speaker, political science and Africana studies double major, Matthew Quainoo. This year’s pool of almost 20 applicants was more competitive compared to just two last year. A board of five members from Student Senate led by Vice President Nick Hetland was tasked with narrowing the amount of speeches to three before finalists gave their final presentations to the entirety of Senate on the chamber floor last week. To be considered, potential speakers had to reach a GPA requirement, have intent to graduate forms and include a description of themselves with their speech. Hetland said that Quainoo was the right choice because of his ability to relate his experiences with those of the general student body. Quainoo, 19, is finishing his undergraduate career at URI in just two years thanks to time-saving options like summer classes and full course loads. He is involved around campus as a teaching assistant and in Sankofa Christian Ministry among other things, where he has been preaching to students for two years. Â He intends to use his speech to continue this work. He will attend Princeton University in the fall to get his PhD. in theology and ethics. Quainoo eventually hopes to follow in his father and older brother’s footsteps and be a pastor and scholar. His mother is also an associate professor at the university and is the director of Africana studies. Because of his busy schedule, Quainoo almost decided against applying to be a commencement speaker because he was worried he would not have the time. He was convinced to change his mind and submitted his work less than 10 minutes before the deadline. The North Kingstown native will next work with the communications department where he will make the final edits to his speech. Once it is finalized, he can no longer deviate from the approved draft. Quainoo said he was nervous to speak for the entire class of 2015, but his faith in God and desire to show his sincerity to the student body helped. With his time as a URI student ending in a few weeks, Quainoo has no plans of taking things slow. He is currently in Atlanta working on his capstone project sponsored by the honors program on the life and work of Dr. Martin Luther King Jr. He will be at Boston University to talk to a professor that has studied King’s life for nearly 35 years as well. In addition, Quainoo will be in Africa for a conference, attend the university’s Black Scholar Awards and a political science ceremony where he will both speak and accept an award, finish classes and preach his last sermon at Sankofa. He’s getting his wisdom teeth removed too. Quainoo said he is most looking forward to representing both the URI and African American communities in his speech. As a young, black male in college, he wants to pay homage to all of the people that fought to get him where he is today. He lists his parents and many others as his biggest inspirations. Once he graduates, Quainoo intends to study and work to make some money for when he leaves for Princeton in late August. Most importantly, he wants to spend as much time with his 13-year-old brother as he can. Senior commencement is May 17 at noon and will be held on the Quadrangle or the Ryan Center depending on the weather.